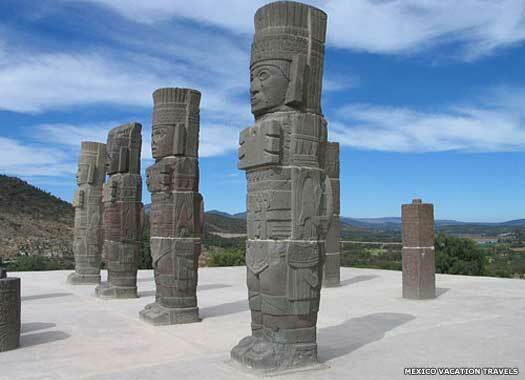 The Toltecs were a Nahua group with roots in the Tolteca-Chichimeca people. During the ninth century AD, numbers of these people migrated from the deserts of the north-west (possibly originating from as far away as modern California) to Culhuacan in the Valley of Mexico. The migration into the valley by their cousins, the Aztecs, doesn't seem to have begun until about a century and-a-half later. By that time the Toltecs had picked up influences from the preceding Mayan, Olmec, and Teotihuacano cultures. Swiftly overcoming the remnants of Teotihuacan, they created an empire which flourished from about AD 900. The empire's capital was Tula (known as Tollan by the Aztecs), a powerful city which at its height controlled much of what is now Mexico. It was situated approximately eighty-four kilometres (fifty-two miles) south of Mexico City. 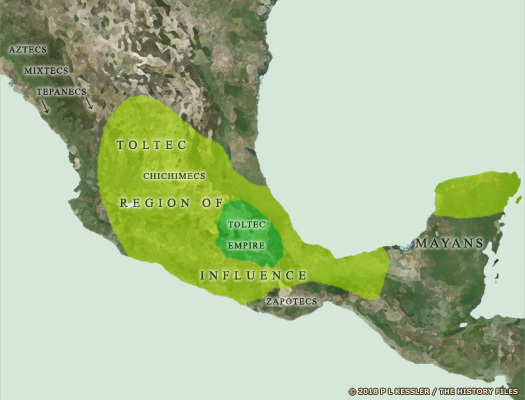 Toltec influence reached as far as the Yucatan Peninsula, where they interacted with the Mayan peoples there, forming Toltec-Maya states (although probably not by means of conquest, a traditional view which has more recently been disproved to an extent). Alice Kehoe suggests that the Toltecs may even have traded with the Mississippian culture and other groups in the north, perhaps via nations in the Huastec territory, although this is far from conclusive (see feature link, right). It is not yet clear why the Toltec collapse came about but there is a theory that the highly military-orientated culture was not able to cope with population movements brought about by a long period of drought in the northern area (similar to the Hittite collapse around 1200 BC). The proven megadrought which took place in the Yucatan around the same time pretty much killed off the Maya civilisation in terms of their advancement, and it seems entirely possible that the same drought affected more northerly regions to such an extent that the farmers of the Toltecs could no longer produce enough crops to ensure the survival of their civilisation. Information on the Toltecs is limited, and has generally been interpreted in various ways, producing mixed opinions regarding just how great this 'empire' really was. 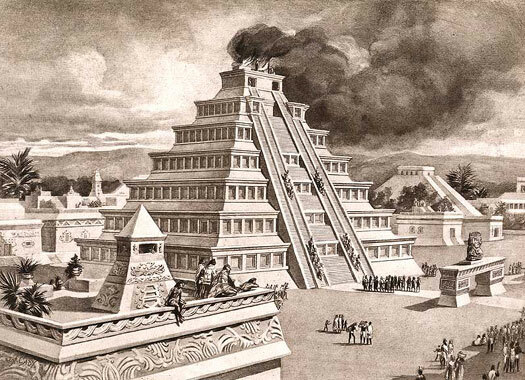 The great city of Teotihuacan is sacked and its grand buildings burned around this time. Somewhat reduced in circumstances, the city may survive into the eighth century AD but refugees find a new home on the southern shore of Lake Texcoco. The Toltecs have been claimed (largely by Fernando de Alva Ixtlilxóchitl) as being one of the various peoples who had lived at Teotihuacan, with a legendary chief named Huémac leading them southwards to a new settlement. However, it is much more likely that they migrate into the region from the deserts of the north-west at some point in the ninth or early tenth centuries and merely graft on their links to Teotihuacan as a way of proving an inheritance of that former glory. Under the leadership of a chieftain named Ce Técpatl Mixcoatl, the settlement of Culhuacan is founded as the first city of the Toltecs following their recent migratory arrival into the region. Legendary chief who 'led the Toltec from Teotihuacan'. After leaving Teotihuacan, the legendary Toltecs of this period are constantly at war against the Chichimecs, although in actuality the Chichimecs only arrive in the tenth and eleventh centuries, and possibly a little earlier alongside the arrival of the Toltecs themselves. Instead these events have the air of tribal conflicts prior to the migrations from the north-west, with the tales being handed down to succeeding generations through an oral tradition. Huémac apparently attempts to end the warfare by creating a unified leadership between Toltec and Chichimec. His successor is to be Chalchiuhtlanetzin, a Chichimec, and Huémac stands down to allow this alliance to progress under his replacement. Chichimec leader of the Chichimec-Toltec Alliance. Son. Ninth leader of the Toltecs. Deposed. A Toltec named Papantzin is claimed as the inventor of a type of sugar made from the Agave plant. He and his daughter, Xochitl, present the sugar as a gift to the Tecpancaltzin Iztaccaltzin but the chief falls in love with Xochitl. He refuses to allow her to leave, promising that she will rule the Toltecs after him. She eventually relents, and they have a son called Maeconetzin whom Tecpancaltzin also promises will rule after him. Xochitl does indeed become the Toltec ruler (following the death of Tecpancaltzin's first wife, Maxio, although it is unclear whether she also rules the Toltecs herself). Later a civil war is sparked which engulfs the Toltecs. Xochitl forms a fully-female unit of warriors in order to end the war, although she dies in battle to achieve that aim. Wife of Tecpancaltzin and 'empress' of the Toltecs. Killed. Taking the honorary (throne) name of Topiltzin-Meconet, this king often appears to be confused with Ce Acatl Topiltzin, the Quetzalcoatl of the late tenth century. This is despite his mother's name being clearly stated, while the ruler Quetzalcoatl himself is also confused with the god whose name he bears (in terms of the god Quetzalcoatl, his mother is unknown). As a consequence, Maeconetzin seems to be entirely unknown apart from in terms of events before the start of his reign. Bridging the gap between the legendary period and the early semi-historical rulers is also problematic as none of the names of legendary rulers seem to allow for the presence of Chalchiuh Tlatonac or Mixcoamazatzin. An extra name can also be added to the later list, immediately prior to the fall of the Toltecs, which seems to be designed to account for at least some of the perceived difference in dating between the legendary and semi-historical periods. Alternative dates of rule: early-mid 800s. ?-877. 'One Flint Cloud Circle' (meaning 'Milky Way [galaxy]'). Under the honorary title of Mixcoatl (meaning 'Cloud Serpent', the Toltec way of categorising the sight of the Milky Way in the heavens), Ce Técpatl is claimed as the Toltec chief who leads his people from the deserts of the north-west into the Valley of Mexico where they found their first city - Culhuacan. Following his death, Mixcoatl is elevated to godhood, a process that only increases under later generations. In some traditions he is claimed as the son of the primordial creator gods, Tonacatecuhtli and Tonacacihuatl; in others, he is the son of the earth goddess, Itzpapalotl (meaning 'Obsidian Butterfly'), while his wife is Coatlicue ('Serpent Skirt'), another earth-fertility goddess. Mixcoatl is considered to be the father of the Centzon Huitznahua, the four hundred sons representing the southern stars. Toltec civilisation flourishes as an empire is born from the city state of Tula, which conquers much of the Mexican region. The settlement of Culhuacan is moved to a fresh site named Tollantzingo. With Tula at the height of its powers at this time, it can easily spare settlers to help populate the new Culhuacan. Other neighbouring sites are also settled and flourish, including that of Itztapalapan. Topiltzin (known by the honorary name of Quetzalcoatl, the 'Plumed Serpent', which is already borne by the famous god who long outlasts this king) appears to greatly expand his capital at this time (although some sources claim he moves it from Tollan to Tula - impossible since they are two different names for the same place). As Quetzalcoatl he is also known as Kukulkán to the Mayans, Gucumatz to the Quiché of Guatemala, and Ehecatl to the Huastecs of the Gulf Coast, revealing the possibility of cultural connections between these groups. The year 968 is an alternate date which is sometimes quoted for the capital being moved by the same king, based on two possible interpretations for Toltec dates. Once there, he presides over what comes to be seen as a golden age of master artisans, cultural builders, and the creation of a true paradise on earth. The Toltecs are seen as the superhuman successors to Teotihuacan. The city of Azcapotzalco is reputedly founded by Chichimec groups, although modern archaeological evidence suggests some form of occupation from around AD 600. At some point between this date and the city's colonisation by Aztecs, it appears to be dominated by the Toltec empire. Upon his death, Topiltzin is succeeded by lesser kings who struggle to solve the growing problems of the empire. These problems are possibly induced by a period of prolonged drought, one of a series of drought periods which wrack the Mayans to the south but which probably also affect the indigenous peoples of what is now Mexico. The Mayan city of Tonina has already collapsed as a centre of habitation, and the droughts appear to come in waves throughout the century. 1025-1039. Added to 'fix' gap between legendary and real rulers. Following the death of Huémac, the Toltec empire undergoes a sudden and violent collapse. This is possibly due to a long period of drought which induces large population movements, most notably by Chichimec groups, bringing disruption to the region. Researchers have noticed a slump in construction at numerous sites across the northern territory of the Mayans in the Yucatan which takes place against a backdrop of severe drought. But the drought here is far more severe than usual - the worst drought that the region has seen for fully two thousand years - a so-called megadrought. It is entirely possible that the more northerly regions of Mesoamerica are similarly affected, triggering migrations which could include the Chichimec, Mixtec, and early Aztecs, and causing the sudden crash of an establishing farming-based society like that of the Toltecs. The Toltec capital, Tula (which falls into the hands of 'barbarians' in 1224), is destroyed by fighting, with some buildings being fired and others being deliberately demolished, possibly over an extended period of time. Certainly there is evidence to show that the city's population shrinks, with outlying areas being abandoned in favour of a reduced existence at the city's centre. Refugees settle in some of the towns of the southern Valley of Mexico. The city of Culhuacan survives the collapse. In the thirteenth century, as part of a general invasion into the Valley of Mexico by further Nahuatl-speaking northern peoples, tribes begin to arrive on the central plateau. Keen to intermarry into surviving Toltec royalty and nobility and claim the honour of Toltec descent, four of these peoples influence the rise of the Aztec empire, the Chichimecs, the Tepanecs, the Acolhua, and the Mexica. A direct descendant of the Toltecs is Atotoztli, fourteenth century ruler of Culhuacan.